The Outrigger Wall Mount Series flagpoles can be attached to any exterior wall to enhance the stately identity of the building and to make your flag display stand out. Ideal for home office or business, these heavy duty, commercial grade aluminium flagpoles make a great choice to display American flags, holiday flags or decorative flag. Offered in four attractive finishes including anodized and stain finishes, these external halyard poles will ensue easy flag hoisting. 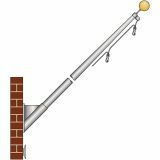 Wall Mounted Flagpoles will make great choices for buildings that do not have enough ground space for installing a conventional flag pole. 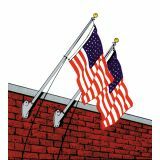 Welcome your audience and leave a lasting impression in anyone who sees it with these impressive wall mounted flagpoles that will protect your flag display from the risks of theft or vandalism as well. Our pole kit comes with all necessary mounting hardware for easy installation. Check it out right away!